Strombafort 50 is quite popular among the sportsmen and contains stanozolol which, in its turn, is famous for such capability as a gain of only qualitative muscular mass. The indications for drug’s administration are quite high. When you administrate such drug as Strombafort, the processes of genetic cell background will accelerate significantly and this, in its turn, will give a start for the most active synthesis of your DNA, proteins, RNA and also tissue respiration (namely, their saturation with oxygen). All these qualities of the drug will lead to the case that the mass of your muscles will start increasing in your eyes. Simultaneously, the drug also beneficially affects the state of your bones contributing to their nutrition with calcium and also will slow the deduction of such components as nitrogen, water, potassium and sulfur from the body. Besides all, the drug will also contribute to the decrease of accumulation of subcutaneous fat which will be useful only for those people who have such a problem. It should be noted that some sportsmen manifest contraindications to the administration due to individual intolerance to the drug. 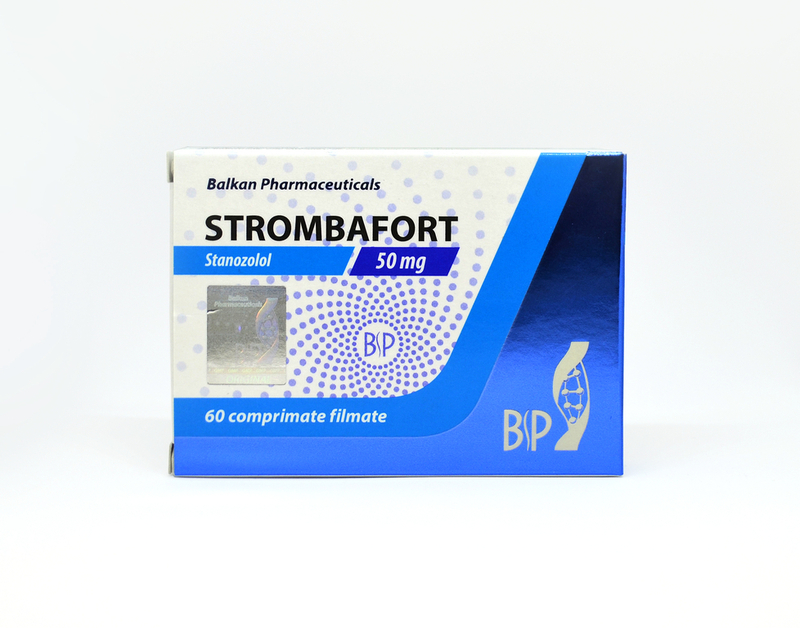 Strombafort represents one of the most popular release forms of tableted stanozolol. Strombafort is an anabolic steroid of synthetic origin which has a moderate androgenic effect. Drug administration leads to inhibition of catabolic processes, production of corticosteroids and anabolic activation. Strombafort allows to quickly accumulate qualitative muscular mass, increase strength indices and simultaneously decrease the fat deposits. Besides these, Strombafort 50 increases the hardness of the bones thanks to calcium absorption improvement. One more distinguishing feature of Strombafort may be called its ability to retain many vitally important elements like potassium, phosphorus, sodium and nitrogen in the organism. The drug is effective even during the drying period when the athlete experiences an essential lack of calories, contributes to intensive workouts and at the same time retains water in the organism. Relying on the sportsmen’s positive reviews about Strombafort from the entire Ukraine who have already experienced its effect, it is possible to surely say that this drug is most effective during the precompetitive period. 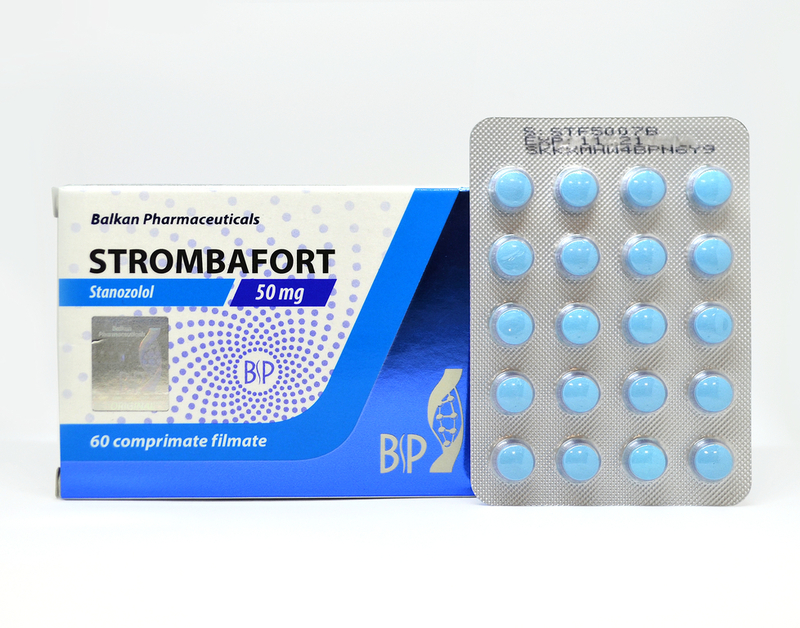 The optimal daily dosage of Strombafort for males is 25-50 mg per day and for women it is approximately 5-10 mg. The course of Strombafort is 6-8 weeks. For the achievement of the maximum effect, it is possible to combine Strombafort with other drugs such as Oxandrolone, Drostanolone, Trenbolone, Fluoxymesterone, Methenolone. If you don’t exceed the recommended doses and strictly obey the instructions, the side effects (natural testosterone production level decrease, virilization cases) in the organism are practically not seen. The administration of the drug indicates its good comprehensibility by the organism in the best way. Many sportsmen who use it for drying have already noted that it has the high effectiveness of excessive liquid deduction in the organism. Also, it differs from other steroids with its minimal risk of side effects appearance. You should just obey the administration method.